Guest post by Lindsey Vontz from 99designs. Lindsey works on Organic Marketing and PR at 99designs. Before joining 99designs, Lindsey spent 10 years managing brands big and small, and helped launch an outdoor apparel brand with her husband in 2013. Lindsey loves helping entrepreneurs find success through affordable branding and useful marketing content. It’s easier than ever to work on a geographically dispersed team. We have technology that allows us to be face to face with colleagues across the globe with the touch of a button, and apps that let us check in from almost anywhere in the world. We have tools that let us collaborate across every time zone, allowing teams to be productive around the clock. As we like to say - it’s always 9am somewhere. At 99designs, our product has always benefited from this global approach. With millions of designers available to work 24 hours a day, our customers can always find someone to help with their design needs. Whether you need a logo design, a tattoo, or a business card - our platform is specifically designed to make working with a designer easy and more efficient no matter where you are in the world. But with all the benefits of a global marketplace, there are just as many challenges when it comes to working on a distributed team. 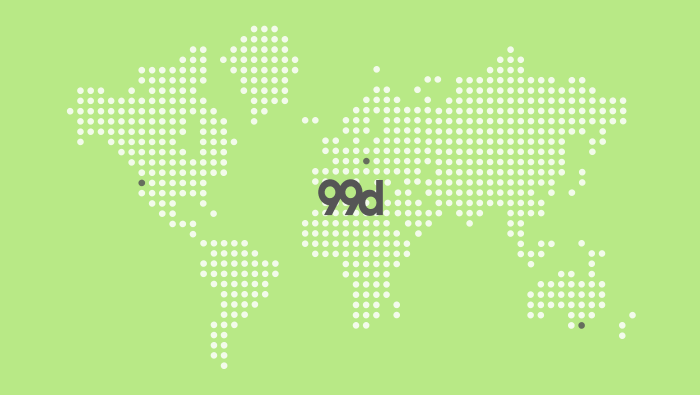 99designs’ marketing department happens to be spread over Melbourne, Berlin, and the San Francisco Bay Area, so we know first hand that collaborating with teams around the world can be tough. That feeling when you need feedback and you only have an hour of overlapping office hours to connect with project stakeholders. Or how hard it can be to build trust between teammates without those spontaneous “water cooler” moments. And the challenge of keeping projects moving and people accountable when you can’t get real time status updates. We’ve spent the past year tinkering with ways to make our distributed marketing team work better, faster and stronger together. And while there’s always room to improve, we think we’ve found a pretty good groove. Here are the top 9 tips from us for how to make your global team gel. While it can be tempting to go “all in” on the tool with the slickest UI, it’s important consider what you’re sharing. If you’re like me, you’re using half a dozen collaboration tools at this very moment, and keeping track of all that information can be overwhelming. That’s why it can be useful to set some guidelines for what gets shared where. Have important information to share requiring careful consideration and follow up? Sounds like it’s time for a good old fashioned email. Need a quick question answered? No need to clog an inbox, that’s what Slack is for. Have a useful resource that’s not time sensitive? Throw that info up on Confluence. Experiment with the tools and style that works best for your team, and then do your best to get everyone on the same page. You’ll all save time by knowing where to find and put the information you need to exchange, and you’ll see fewer deliverables fall through the cracks. With all of the tools we have at our disposal - it’s still hard to imagine anything will replace having team members in the same room. One of the biggest champions of this tenet at 99designs is our Senior Brand Marketing Manager, Laura McLeod. While I was on maternity leave earlier this year, Laura actually moved to Oakland from Berlin for three months to help the team cover the extra workload. Your relationships really matter, and like every relationship in your life it’s the time together that counts. Whether that's a casual chat over a coffee or a more formal team get together, make the most of it, embrace it and make sure it's regular. It's how you get the really great inter-personal dynamics working, learn more about each others' likes/dislikes, and develop the trust you need to get great results. Go and see them, arrange regular team lunches, or work in annual or bi-annual summits into your plans so you can really get the facetime, working with what plays most effectively with your schedules (or timezones). Trust is one of the most important things when you're collaborating remotely and it's how you come to get those honest moments, which leads to less hold ups, less politics and ultimately amazing work you can all be proud of. Once you've got the trust you can really break down the boundaries and start passing work (remotely) between each other like it’s a walk in the park. You'll also enjoy it a lot! When in person time can’t be done - do your best to replicate it. Our fix is pretty simple. Pick one or two days a week and wake up a little earlier (or stay a little late). It must be voluntary: Forcing your team to time-shift defeats the purpose. Waking up early or staying late should happen on days when it works for them. If it doesn’t, don’t force it. It must be balanced: Time-shifting means you leave early or get in late to make up for those lost hours. Hold your team members accountable for leaving when they say they will. Yes, it's early. But it's worth it because it offers you time to have real, casual conversation with your remote colleagues rather than delayed Slacking back and forth. It's unfair to expect Berlin team to stay late every time we request a 9am meeting. Putting in the effort on both sides improves general team rapport and camaraderie. When I get in at 7am for timeshifting, no one else is in the office, which is awesome. I'm able to take Slack calls from my desk to go over things by voice rather than typing it all out, making it feel like our Berlin teammates are right here with us. Timeshifting is how I developed a relationship with Vecci - we started hopping on video calls every Tuesday morning, and since we each had time on our hands (Vecci wasn't in a rush to leave the office since it's at 4pm her time, and I didn't have any other meetings for a while since it's 7am my time) we had time to casually chat about life, get to know one another outside of work and develop a positive rapport that made it easier for us to work with one another. I now feel like I really know her even though we've never met. Above all, timeshifting is about making time for in-person meetings with colleagues on the other side of the world. This time is best spent when everyone is relatively happy to be there. Not forced, not stressed, not bitter about the early/late hour. With people across many timezones or not in the physical space where a project is happening and decisions are being made, remote teammates are out sight and out of mind. It's easy to move forward with a project without getting the whole team's input, especially if you want to move quickly. While it may save time on the current project, you'll be sure to create chaos and discord among the whole team. Leaving out remote teammates' opinions leaves them feeling left out and that their opinion doesn't matter. Additionally, you didn't get valuable insight from smart people. Build in extra time for project timelines to ensure everyone has sufficient time to contribute. “Working with a remote team is a one of a kind experience that will help you enhance both your expertise and social skills – if everyone in the team knows that they can trust each other. If you just spend some time talking about numbers, you'll never know how your remote colleagues really live and work and how your work could benefit from those differences. In fact, we all spend most of our time with our colleagues – and therefore, should try to bond with them in a way that is a) easy and b) effective to achieve the goals we set up as a fabulous remote team. The bottom line? Make an effort to bond with your remote teammates in a way that feels authentic to you - just as you would with the ones you sit next to every day. And if you’re the team leader, it’s on you to make that a part of your team’s culture. “Empathy is critical in any team dynamic and it's is a much bigger challenge for distributed teams to establish. Most conversations have a formal structure and are about work. There's no shared 'how was your night' chat when making your morning coffee or 'I need your opinion on something - let's grab lunch’ moments. We hope these tips are helpful to you and your distributed teams, wherever you may be.